Top : Propulsion : Drives : Konrad Marine, Inc.
Konrad Marine designs and manufactures stern drives with the power and endurance necessary to propel continuous duty vessels. Thicker castings, oversized bearings, super alloy gears and the industry's largest U-joint allows Konrad Stern Drives to perform best in any application. 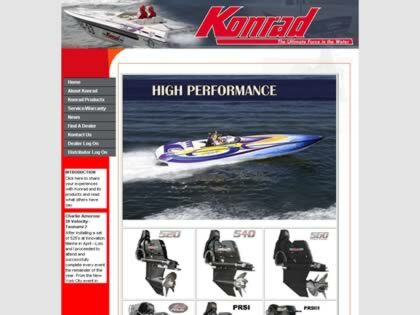 Web Site Snapshot: If available, above is a snapshot of the Konrad Marine, Inc. web site at http://www.konradmarine.com as it appeared when this site was added to the directory or last verified. Please Note that Boat Design Net has no involvement with the above web site; all content and images depicted in the above thumbnail are the property and copyright of Konrad Marine, Inc. unless otherwise noted on that site. Description: Konrad Marine designs and manufactures stern drives with the power and endurance necessary to propel continuous duty vessels. Thicker castings, oversized bearings, super alloy gears and the industry's largest U-joint allows Konrad Stern Drives to perform best in any application.